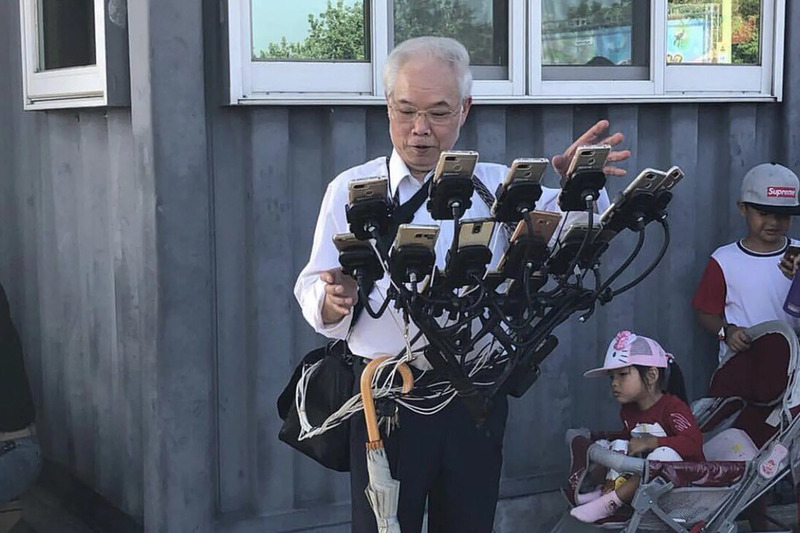 We first covered Chen San-yuan, a 70-year-old in Taiwan that has been dubbed “Pokémon Grandpa,” a few months back when he was only using 6 devices to play Pokémon Go. Now, he’s using 15 mobile phones at once while riding his bike to catch all the rare creatures that he can. How did it all begin? He learned about the game from his grandson in 2016, and has been playing ever since. “I used one cell phone back then and kept playing and playing. After a month, it became three cellphones, six cellphones, nine cellphones, 12 and 15, like that,” said Chen. Read more to see his 11 smartphone rig from a while back and for additional information. Chen can reportedly play non-stop overnight, mainly thanks to his custom-made portable battery packs that have been rigged together to provide a near endless source of power. He says that he spends about $300 USD a month to buy virtual currencies in the game. Will this hobby continue? Well, his main motivation now is actually tracking down real-life ‘Pokémon Go pals’. “But one aspect of Pokémon Go that Chen rarely partakes in is gym battles, as he feels it wouldn’t be fair to other players. He’s a gentle soul who would prefer to walk around catching and upgrading rare Pokémon. We’re sure, however, that should he change his mind, the Elite Four would welcome him into their ranks,” according to The Verge.